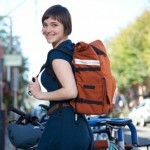 An exclusive bag designed for Filmed by Bike! Curtis Williams of North St. Bags has created a stunning wax canvas bag. It’s one classy piece of work. He’s also including a matching top tube roll. You think you’re hot now? Just wait ’till you’re rollin’ around town with this set.